How do I compare two ObservableList? Since there can be many sources (e.g. book, video, magazine, etc) )with the same exact title in the database but possibly different authors. I'm attempting to compare a list of Authors for each existing source found in the database to the list of authors entered by a user. So this is my test code for planning and constructing this method in "DoSourceAuthorsExst()" which will most likely become a boolean method. The 'sourceAuthors' will be the result of retrieving all the authors of an existing source as Author objects and compare that list to the user's list of author objects, which the authors table is based. The two ObservableList<Authors> objects are identical. I literally copied one and pasted it -- renaming the second as 'sourceAuthors'. It seems no matter what I do, the result is always false. I feel I'm overlooking something simple, I'm just too thick to see it. I could use a second or more set of eyes to see it. You probably need to override equals() and hashCode() in your Authors class. That may be why "contains()" doesn't return true. It might contain the same values, but you create a new object each time. If you would implement your own toStringmethod and check that for equality on each object in the list it would return true. Why have you got null as a middle name anywhere? Avoid nulls as much as possible. 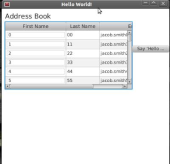 Work out how to create an array of middle names, so you can give somebody an array of different sizes starting from 0 depending on how many middle names they have. Good points and I totally agree with you both - So I appreciate this site and your patience and efforts. This is the first application in Java for me and it is further compounded by needing JavaFX and Databases - and I've had 1 weeks worth of high-level training and hit-miss tutorials. -- Sorry for the wrong forum. After continuing to research, I understand now why the object comparison will always return false. So I was attempting to build out an override of 'equals' as suggested but I was failing miserably. So I think the 'toString' override is a good suggestion too and I should try. I will refactor the naming the 'Authors' to Author. I will reply with my success or failure! Thanks! It is greatly appreciated. A way that wouldn't require any overide of methods would be to create your objects first and thenb assing them to both lists. What does the documentation for different kinds of observable List say about the equals() method? I thought there was an equals() method in AbstractList, so all different kinds of List return whether they have the same elements, so a linked list can be equal to an array list if they contain the same elements. Note that this will throw a null pointer exception if any field is null. I would suggest modifying your constructor to either: a) throw an exception if any argument is null, or b) convert nulls to empty Strings (""). Also, your member variables (aka fields) should begin with a lower case letter. I bet you will go for the medium version. These are some good thoughts. Let me try these. As a Greenhorn, I need to run them through my thick head a couple times to understand what is happening with each. I did construct the override of "toString" but it has to be too precise. The difficult piece for me every time is dealing with null vs "". I did create an Object compare method to help with this in another section of the code, which maybe I can incorporate. Thanks! I should have something soon! Oh... and the table entries may be in any order, which I can handle with some looping. I forgot to mention that caveat. Scott Vallery wrote: . . . Thanks! . . . I hope my mistake yesterday didn&apos;t confuse you; I have just noticed that I wrote || instead of &&. Please show us your compare() method, but there is a risk that I shall tell you to change its name as soon as I see it. Remember that List equality includes both identity of elements and their order. And rhyme isn&apos;t a good name for a List at all. Scott Vallery wrote: Oh... and the table entries may be in any order, which I can handle with some looping. I forgot to mention that caveat. What tableentries are you talking about? In to a tableview? Cause there's a simpeler way to do it, setting the celValueFactory to the propertyValueFactory. Daniel -- sorry, I wasn't as clear as I should have been, but if a user doesn't know a source exists, they may add the authors in a different order that listed on the database retrieval. However, I see what you are saying... and I could probably just us the 'sorted()' method on each ObservableArrayList... duh!. Like I said, I can be thick. Right now the goal is to get something working then begin to refactor to be more efficient. I feel (obviously ) this application can be far more efficient and understandable. I'm just not experienced enough and naive at the present time. Anyhow, this is working at present. I continued with the overriding of the "toString()" and applied part of Carey's suggestion to convert any 'null' value as a "". My Convert method may be in efficient, as I mentioned before, the null and "" and " " are what I'm trying to handle. Somebody has pointed out that convertToEmptyString() is a bad name for that method.